Heels- Jessica Simpson Free Shipping on all $100+ orders at JessicaSimpsonCollection.com! Vintage Tapestry Bag- Gifted by P.E.!! LOVE IT! Earrings- Made by my good friend Fallon from Hey Babydoll Boutique Visit her shop here! Lipstick- MAC Ruby Woo Gifted thank you Fallon!!! love love love this dress - and I love it even more with that blazer - those colors work so well together - I hear your sneez from here...lol get better soon hun. Love those shoes! Feel better soon! 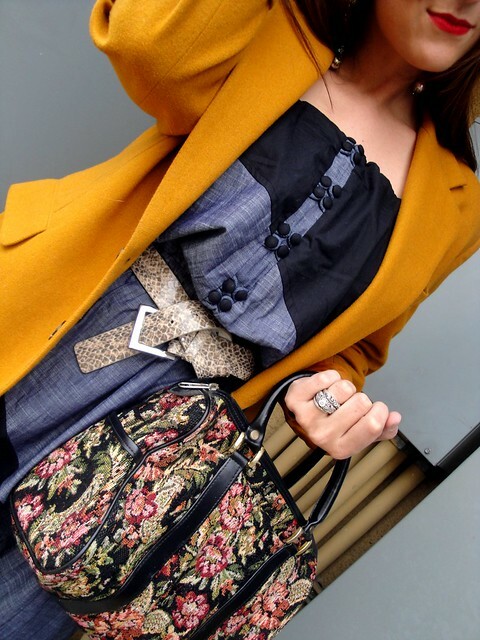 that is a really fabulous maxi dress, I love the pattern and color, looks wonderful with a mustard blazer. Haha, I think it's cute how you guys say goodbye... I love how your wore your belt - that's a great solution for the cute ones that are too big. Thanks for the inspiration! I am loving that dress, I have to go and check out their site!! The blazer and shoes go great with the dress!! hope you had a wonderful birthday. that dress is gorgeous! Wow. Great thrifted blazer and amazing styling. In fact, I love your style so much, I'm a new follower. Landed here from the Pleated Poppy. LOVE your blog and your style....think I might have to join your thrifters group-- love me a good deal! !And absolutely LOVE the maxi dress so much I just ordered one for myself! you & your style radiates! Wow, that is one gorgeous color combination! you are so freakin' cute. I love the blues and mustard together, great color combo! I need more maxi dresses, so comfy and cute! Hooray for birthday gifts, holla!! Your look beautiful. I like the mixture of different textures in your outfit.